We supply high quality Roman Ring Set that is durable and high in quality. 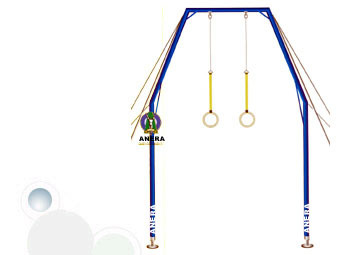 Our ring set comes with adjustable, shock absorbing spring system that offers ease and comfort to the gymnasts. Description : Arena made of 2" sq. pipe covered with foam padding all upper portion folding and portable type with side stay wires, chain, hooks, coupling, revolving hooks, fiber rings & belts.